The dynamic field of trauma nursing has emerged into a specialty that demands a Nursing Secrets book of its own. 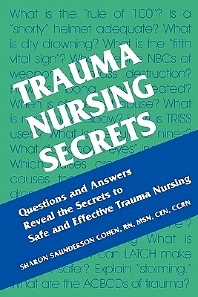 Trauma Nursing Secrets covers trauma nursing from the pre-hospital phase to the trauma resuscitation area, and follow the patient into the Intensive Care Unit and then into rehabilitation. Specific issues covered include forensics, trauma prevention, system injuries, toxicology in the trauma patient, organ procurement, skin, wounds, and ostomies, and evidenced-based practice.